Enjoy the inspired Pillars of our Faith music from award-winning songwriters David Huntsinger and Kristin Wilkinson in a new Songbook. 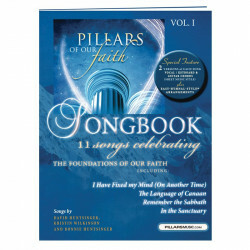 In fact, this Pillars Songbook is two books in one! All eleven songs are arranged in EASY-HYMNAL-STYLE and regular piano/vocal sheet music style. Guitar chords are included in both versions as well, along with photos from the Pillars Concert in Battle Creek, Michigan, and interesting song commentaries.